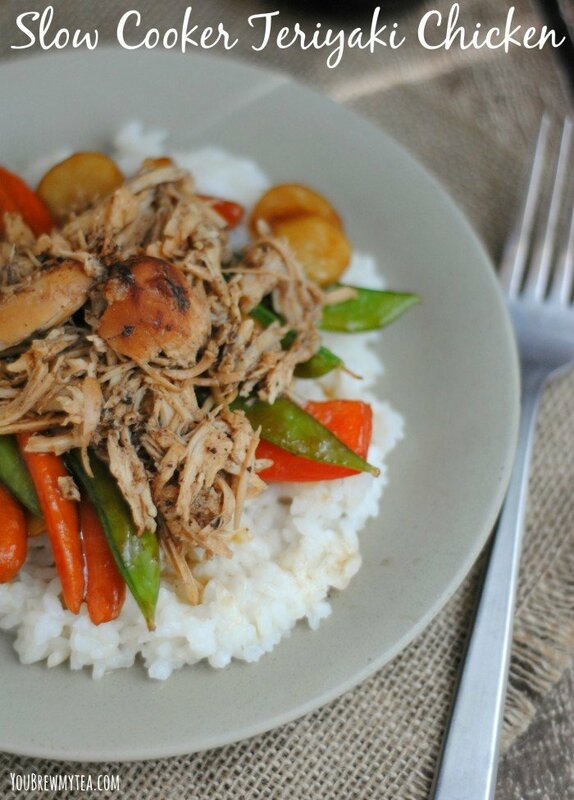 Combine two of my favorite things with this Slow Cooker Teriyaki Chicken that my friend Jill made for us recently. It’s so easy to throw together, so delicious and seriously one of the most versatile Crockpot meals around. This is great when served with veggies and rice, but the meat alone is perfect for going in lettuce cups, wraps or even on a sandwich. I also love that this recipe is only 5 SmartPoints on the Weight Watchers Beyond The Scale program for the chicken and sauce. I love that Jill makes her own homemade teriyaki sauce instead of using the sodium laden store bought varieties. While you still use soy sauce in this recipe, you could easily substitute the low sodium variety, or our own personal favorite Bragg’s Liquid Amino’s. A simple mix of sauce poured over the chicken breasts slow cooked for 4-6 hours means you have a super easy meal on your hands. She suggested serving with stir-fry veggies and rice, which is a great low calorie and filling meal. You could also do as I suggested before and go the low carb version and add this to lettuce cup for an Asian taco theme. Place the chicken breasts in the bottom of the slow cooker and turn on low. In a medium bowl, combine the honey, soy sauce, apple cider vinegar, garlic, and cornstarch. Whisk until mixed. Pour the mixture over the top of the chicken breasts. About an hour before serving. Remove the chicken breasts and shred. Add the chicken back into the slow cooker. I used the Weight Watchers online Recipe Builder as part of my plan with them to calculate the points for this recipe. These points are ONLY for the chicken and sauce mixture. Vegetables are free on SmartPoints when cooked with no butter or oil added. You can serve in lettuce cups, with veggies, or over rice. I know a lot of people also like cauliflower rice as a good option. Choose what works best in your points allowance for the day. If you aren’t part of the online or meeting plan with Weight Watchers but want to work the system, you can look into the Weight Watchers SmartPoints Calculator as a great way to calculate your daily points as well as your points for recipes like this one. 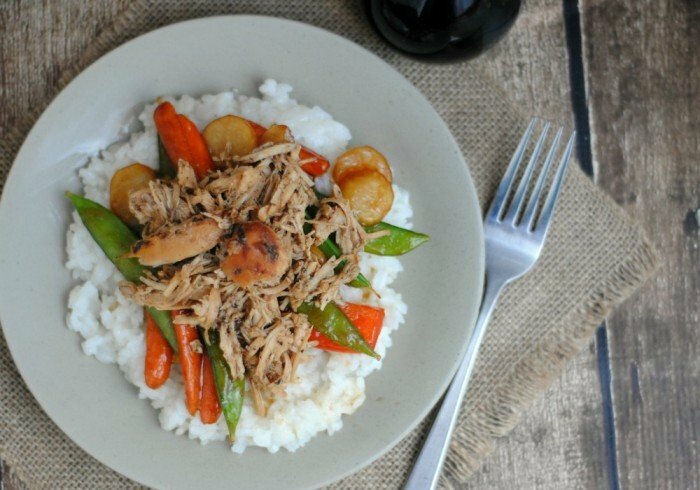 When I think of comfort foods, this slow cooker teriyaki chicken is on my list. It just has that comfort feel I think of when I need something yummy. The benefit with this meal is it isn’t high in fat and calories like a lot of my comfort foods tend to be. We also have used this mixed with cabbage in our Baked Veggie Eggrolls Recipe to make it bit heartier. Just mix the shredded chicken in with the veggies and roll like normal. This looks great! I’ll be pinning! I love anything I can do in the slow cooker. And yes, homemade Teriyaki sauce sounds so much better than store bought! Thank you for sharing with us at the #HomeMattersParty this week. Hope to see you again this Friday! Thanks for letting us share! It is so delicious!